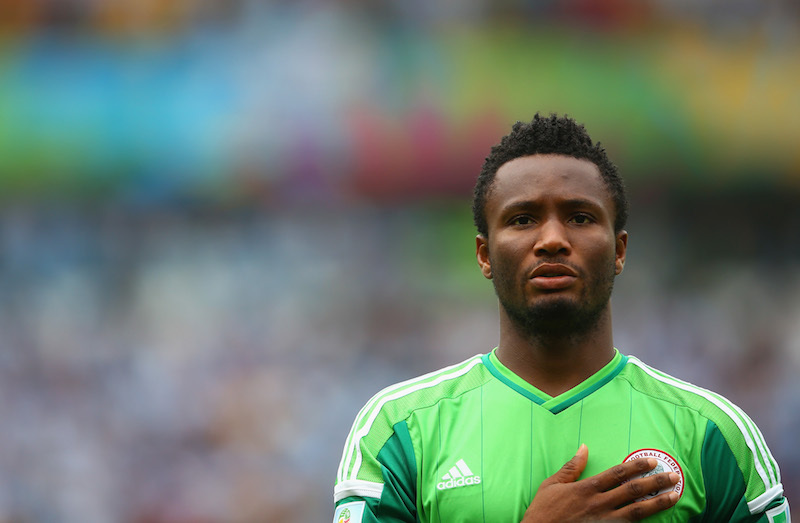 Captain Mikel John Obi will cary his country's flag at Friday's opening ceremony. Michael Obi's son, born John Michael Nchekwube Obinna, was accidentally re-christened at the U17 FIFA World Cup in 2003 when his own country submitted his name as "Mikel" instead of "Michael". Michael liked the sound of Mikel, so Michael became Mikel. It's unclear when the Obinna was changed to just Obi, or how those naming conventions all work out, but when Mikel joined Chelsea in 2006, he came to be known as John Obi Mikel. Or was it John Mikel Obi? Perhaps Mikel John Obi? Mikel Obi? Obi Mikel? Mikel? Finally, after all these years, the Chelsea midfielder has decided what his name should be once and for all. His full name now is Mikel John Obi. With that confusing situation sorted, we can turn our attentions to the other potentially confusing situation: Mikel's Chelsea future. As one of the longest serving Chelsea players of all time yet still just 29 years old, Mikel is set to enter his eleventh year at the club. But he only has one year remaining on his contract and so far, there's been very little indication of any potential extension. Mikel had talked previously of waiting until this summer to make a decision — after interim manager Guus Hiddink helped revitalize his career — but for right now, the man, the myth, the legend is fully concentrating on his Rio Olympics adventure, where he'll also get to carry his country's flag in Friday's opening ceremony. "To be my first Olympics and getting this huge honour made the tournament 10 times as exciting for me. I was like a kid that had just been given their first piece of candy when they told me. It's up there with the Champions League, which was the pinnacle of my career, for different reasons." "To carry the flag of your country at an Olympics is absolutely amazing. You're leading a whole nation going into the biggest sporting event there is. To represent the flag of Nigeria, not just the football team, is incredible. It is difficult to leave Chelsea at this time. But I explained to the club why I wanted to go and I thank them for their understanding and allowing me to be a part of this. The coach also gave me his blessing. He told me to make sure I do well and bring back the gold medal!" "Obviously, it is hard to be away because I want to impress the new coach. I had one week of pre-season training and you need more than that if you want to prove yourself to a new manager who wants to change everything around. It is a risk that I have taken but I am willing to stand by that. I hope after the Olympics I can go back and prove myself." While the tournament has interrupted his preseason preparations under new head coach Antonio Conte, Mikel is determined to give it his all this upcoming season and put himself in the best possible position for his next contract. "I am definitely staying at Chelsea and I will try to give my best to the club, like I have always done. I want to help the team fight for every point, every win and to win trophies. I also want to help the team qualify for the Champions League again as soon as possible." "For 10 years I have been going to the same training ground, the same locker room. It is an amazing club, with an amazing owner. They are like a family to me. It is a place that has become a part of me." "I have a year left and then we will see what happens. If I play well this season, it will help me earn a new contract. I will give 120 per cent every time I'm on the pitch or come off the bench. I will always give my best." "If Chelsea decide they want to talk, then we will talk. If I have to move on, I'm sure there will be plenty of clubs out there where I can continue my football career.It will be difficult to leave but these things happen. You have to move on one day." "My happy memories of Chelsea will never go away."